Michigan and Notre Dame's rivalry will be renewed in 2018, and while the majority of the reaction from the college football world has been excitement, those in Fayetteville, Arkansas, aren't as thrilled. That's because, in order to open up a spot on the schedule for Notre Dame, Michigan had to drop its scheduled series with Arkansas in 2018 and 2019. 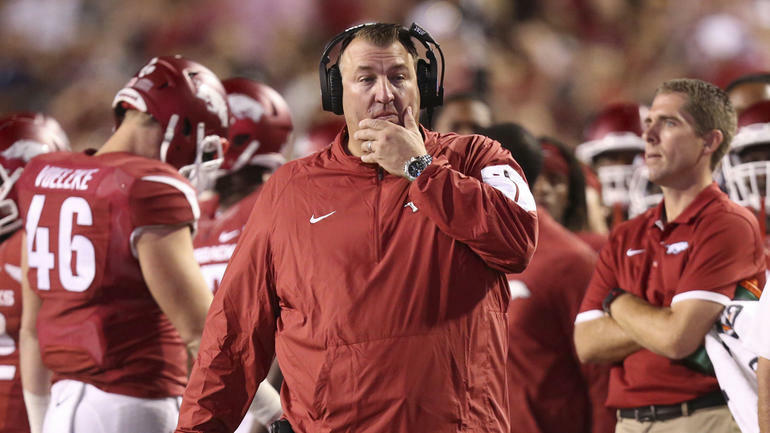 According to Sports Illustrated, Michigan will pay the Razorbacks $2 million for their troubles, but it still isn't sitting well with Razorbacks athletic director Jeff Long and coach Bret Bielema. "Primarily, we are disappointed in Michigan's timing in pulling out of a non-conference football series between the SEC and the Big Ten that has been set for four years," said Long in a statement, noting that he found out about the cancellation simply by an email the night before the announcement. "While there are many other quality opponents that would help us strengthen our non-conference schedule, the late notice of Michigan's cancellation makes securing those games substantially more difficult. Our focus will be to find a program that welcomes the opportunity to compete against a nationally respected program in the most competitive conference in college football." Bielema was likewise saddened by the news when asked about the cancellation by the Chicago Tribune. "I'm definitely disappointed," Bielema told the Tribune. "It was going to be an opportunity to play one of my favorite teams from the Big Ten. "He also couldn't help but throw a little jab at Jim Harbaugh and the Wolverines when asked about what the program planned to do with the $2 million buyout. "Maybe host a satellite camp in Cabo," quipped Bielema. That's just a beautiful quote, and it's a shame that we won't get two years of Bielema and Harbaugh jabbing at each other with jokes.Michigan-Notre Dame being back is great for college football, but I wish it didn't have to come at the expense of Arkansas-Michigan. Not only would the quotes have been great, but there would have been so much beautiful power football being played on the field, with tight ends and fullbacks everywhere.